Those who established the Northern Kentucky Area Planning Commission (NKAPC; PDS’ predecessor) in 1961 also initiated the community’s rich history of aerial photography. Toward the goal of creating technically-accurate maps for local comprehensive plans, NKAPC contracted with American Air Surveys, Inc. in 1962 to provide black and white aerial photographs for all of Kenton and Campbell Counties using federal grant money. (Campbell County was part of NKAPC’s jurisdiction at that time.) These photos were critical to development of the first area-wide comprehensive plan for Kenton and Campbell Counties (as required by Chapter 147 of the Kentucky Revised Statutes) in 1972. As federal dollars for aerial photo projects were eliminated, a local collaborative effort was formed to continue local mapping and aerial photo efforts. This partnership established what is now LINK-GIS. In 1984 the partnership worked with Sanitation District 1 (SD1) to map all sanitary sewerage lines after a hepatitis outbreak, NKAPC updated local comprehensive plans, and the Kentucky Transportation Cabinet (KYTC) needed updated photos for major transportation routes. The opportunity to serve three project needs came together in 1985, when NKAPC, KYTC and SD1 contracted with GRW to acquire 1985 aerial photos for these important regional projects. The GIS partnership contracted with GRW Aerial Surveys, Inc. again in 1989 to create the area’s first color aerial photos and base map data. The GIS partnership pursued additional photography in 1995, 1999, 2004, 2007, 2008, 2010, 2012, 2014, and 2018. Meanwhile, planners updated the 1972 comprehensive plan and its various amendments in 2001, 2006, and 2011 using these aerial data. The parallel pursuits of PDS’ land use planning and GIS staffs merged in 2014 when they collaborated to produce Direction 2030. Your Voice. Your Choice., one of the nation’s earliest online comprehensive plans complete with interactive digital maps. Use the LINK-GIS interactive mapping site with historic aerial base maps. Check out Kenton County’s Direction 2030 comprehensive plan. Contact LINK-GIS at 859.331.8980 to inquire about oblique photos. POSTSCRIPT: The Story Map of which this illustration is a part may be found here. 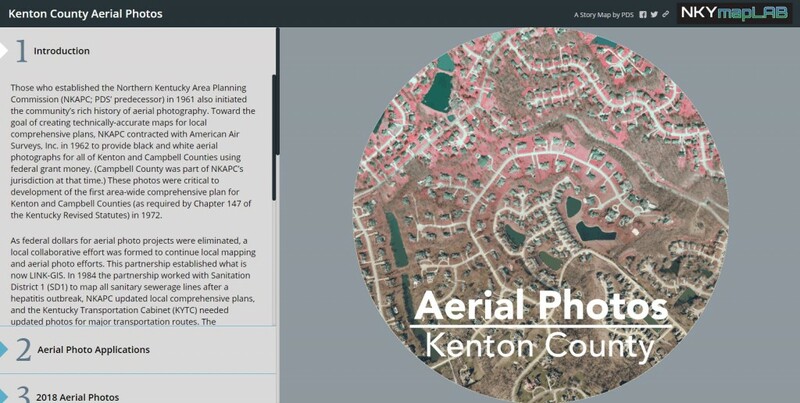 By the end of this Story Map experience, you will have a better understanding of the aerial photo products available in Kenton County. 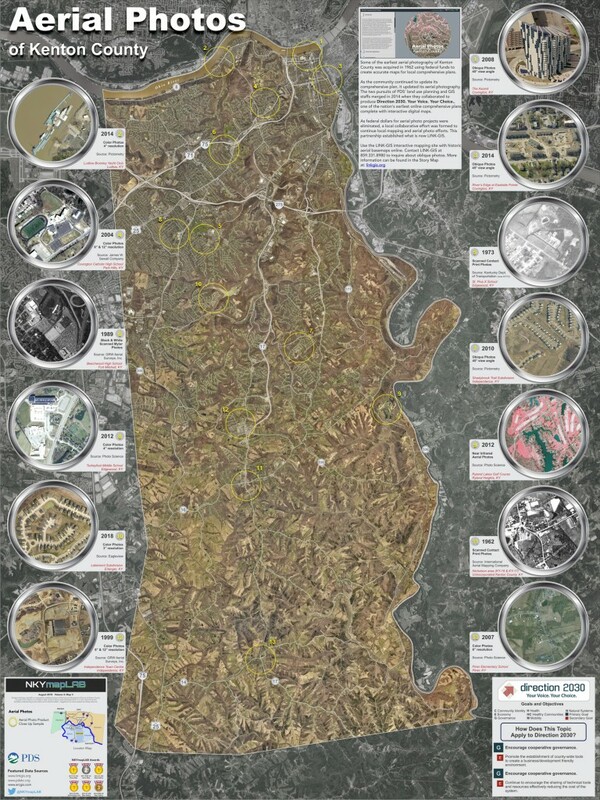 Click on the image above to view the Kenton County Aerial Photos Story Map.